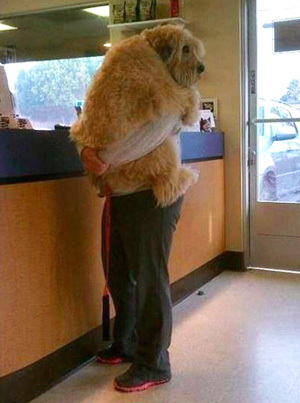 Lets face it, a lot of dogs do not like going to the vets. They may become anxious, scared and nervous, some even hyper and aggressive in a bid to deal with it, others might shut down waiting to strike when they feel the time arises and may even end up fighting with other dogs in the waiting room or biting an unwary vet. For some owners and their dogs going to the vets is an anxious time for both so they only go when really neccesary as it involves fear and muzzles etc, a dog in this suituation will never improve. For some dogs the whole affair may just be traumatic. The time to deal with this problem is before it starts, when he or she is a puppy in the early learning stage. Obviously it is different if you have taken on an older dog and inherited a problem like this and there are things you can do to help, I will cover this later in this section; firstly we will concentrate on your puppy. During your dogs life you will no doubt go many times to the vets and surely it would be better for all concerned if these trips were easy and trouble free. It is well worth the initial time and effort to make it so. Most peoples and dogs first trip to the vets is for the first or second vaccination, which to your pup will be a novel experience and if it's to have a needle put in him or her and handled badly by yourself or the vet, most probably a scary one. If your pups first experience is (in their eyes) a scary one, and happens in his/her first fear period, then there is a chance he or she might well develop a lifelong problem with going to the vets; they could also associate the fear of the whole experience with the not just going to the vets but could also to the smells at the time, white coats (if worn), the waiting room, a male vet, a female vet, any vet, a certain vets voice etc etc, the list is long. I am not saying a dog will become scared of all these things just that he or she could associate the fear with any thing in the environment at the time when they experience the perceived fearful situation, which could also lead to problems away from the vets, say a problem with any man with a beard as the vet who roughly handled your pup and stuck a needle in him had a beard.THIS IS THE WAY DOGS THINK AND LEARN. So what you need to do is take your pup down to the vets before your first trip there to actually have something done. Firstly ring the vets and tell them of your plan, ask if you can come down when it is quiet with no other dogs in the waiting room. A good vets should agree as it is beneficial to them too to have a well behaved dog to see later on. Ask too if you can walk in a treatment room. You will have to carry him/her and not put them down as they might not have had their inoculations yet, make the first visit a shortish one, a jolly one ( no saying ahh its alright darling) be normal and jolly so as not to make your pup think it is something to worry about, but more of a jolly affair. This may seem like a lot of effort but it will be worth it, not only are you making a trip to the vets a good thing you are exposing your pup to another pleasurable novel experience which will help his or hers development and socialisation. Try to do this a couple of times before your actual first proper visit for treatment, making them a bit longer each time. It is a good idea to have a favourite little treat for them when you have finished your visit, take it with you so you don’t have to use the vets boring dried treat; give it with a jolly good boy/girl before you leave, and remember, make it a special treat. Your first actual trip for a treatment should be made a jolly affair too, without going over the top. Your pup will be watching you and you should give off an air of normality with jolliness thrown in, this includes the trip in the car as well, be normal about it; no saying "ahh ! we are going to the vets but it will be all right,there there". If the vet seems overly rough or abrupt with your puppy then say something, for this first actual experience is important, stress calmly that this is your pups first proper visit and you want it to go as well as possible. If a vet is recommended or you think that they get on well with you and your pet then stick with them, ask to see them on future visits if possible, it will be beneficial for all concerned. Some pups (and dogs) will be better with men or with women vets so as long as they are good vets stick with them. When the treatment is complete praise your pup and give them a special treat before leaving the treatment room. Carry on the happy normal routine until you leave the vets. Obviously if your trip to the vets is an emergency visit you may not be able to see your preferred vet so then you will have to see whoever is available but for fairly routine things you can plan ahead a bit and see your chosen vet. Many breeders/owners may have already given the first vaccination when you pick them up which gives you two weeks before the booster, time to get in a couple of visits to the vets and to other places (don’t allow your pup on the floor outside until after second jab). If you have to make the trip to the vets soon after acquiring your pup for his first jab then make it a pleasant jolly affair as explained with a hopefully helpful, friendly vet. If you put in this bit of effort at the start then hopefully trips to the vets in the future should be a stress free affair, sadly some pups do require early trips to the vets with problems of a breeding or hereditary nature and these need handling the same way. Once your pup has had his second jab you should still take the odd trip to the vets for a jolly and he can meet other friendly dogs while there, try to make sure they are friendly though, if he or she has a bad experience with another dog at an early time in their life in the vets they might associate this with the vets and you guessed it, become scared of the vets. Some vets also run puppy socialisation classes (ask your vet), if these are well run (no monster, much older pups terrorising everyone), they are a good idea, your puppies socialisation is top of the list and if it is also in the vets and goes well it is another good association to the vets for your pup (see the /puppy-training-and-socialisation and /socialising-your-dog topics). Remember not to do too much too quickly with a new pup, allow them to settle in a bit before doing too much socialisation type exercises, make things fun at all times, so they want to do them again, and don't scare them. Now lets take a look at the older dog. If you have taken on an older dog and he/she has a serious problem with going to the vets (and no other bad behavioural problems) then for whatever reason he/she has a bad association with the vets or something related to it. You need to try and turn this association around to a good one; for this you will need the help of a good behaviourist. You could try taking him to the vets for jollies as with a pup to try and turn the bad association around, not for treatment but just as a jolly visit, use high quality treats to reinforce any good behaviour. You could try a different vets and see if the behaviour is the same, many dog behaviour problems are context (environment) specific so they might be better at a different vets. A dog might be averse to a male or a female vet due to earlier problems, if so, only see male or female vets. You could go to the vets when it is empty to see if the problem is with other dogs in the vets. It all depends on how bad the dogs reaction is to the vets (or something connected to it). I would not think to give any serious behavioural modification advice without seeing a dog for myself as often there is a lot more than just a problem with the vets going on. Speak to your vet first to rule out any clinical reasons for their behaviour and then ask about further options like a behaviourist. Often with older dogs with serious behavioural problems prevention and or management is better than trying to cure, only a good behaviourist could tell you this, sadly some vets have very little interest in or actual canine behaviour training, concentrating on the clinical issues only, at present only a week of their 5 yr course is dedicated to it, though I would like to think this may change in time as the relevance and understanding of dog behaviour in these instances is becoming more understood. For some more relevant advice and information take a look at my /how-dogs-learn page.